K.C. SAULET During an incident he later lied about, according to King County sheriff John Urquhart. 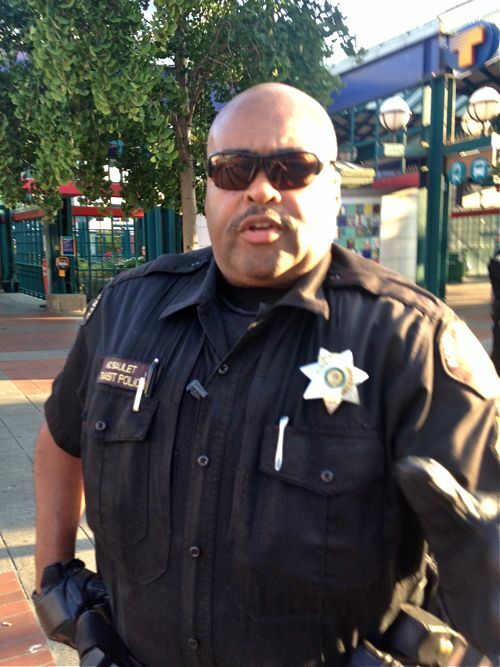 King County deputy Patrick “K.C.” Saulet has been fired for threatening to arrest me last summer, when I was photographing several officers on a downtown street corner, and then lying to investigators about the incident, says King County sheriff John Urquhart. The termination is effective today. 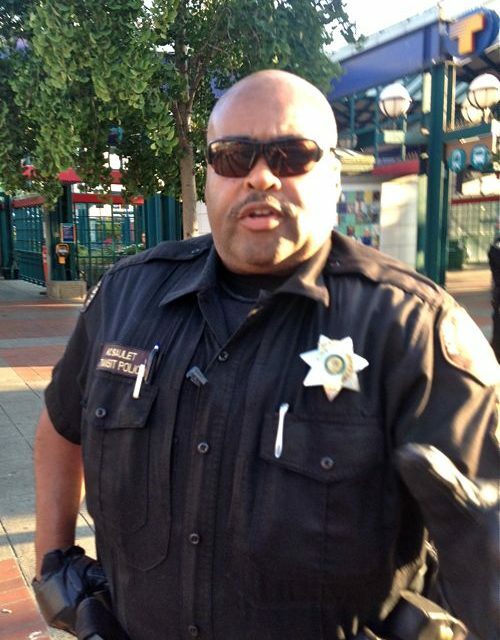 After a six month investigation—which included an internal recommendation to terminate Saulet and the King County police union attempting to overturn that recommendation—Sheriff Urquhart issued a disciplinary letter on January 30. Suffice it to say, in my judgement, the evidence shows that (i) you abused your authority in your dealings with Mr. Holden on July 30, and (ii) thereafter, rather than be accountable, you attempted to recast events in a light more favorable to you. Stated broadly, for example, you claim you interacted with Mr. Holden in a civil, professional manner that was nothing more than ‘social contact’; you did little more than tell him for his benefit that he couldn’t ride on Metro property because doing so is a $66 infraction; [you claim that two other deputies] Shook and Mikulcik told him the same thing; and you once calmly pointed him in a direction you were suggesting he leave. But the evidence is that you approached Mr. Holden because you took exception with him lawfully exercising his right to take photographs of you and your colleagues while lawfully standing on public property; you were agitated and confrontational; you essentially ‘squared off’ with him; you expressly and/or implicitly threatened to arrest him if he did not leave immediately in the specific direction you pointed, not once but five times (misidentifying public property as private property in the process); and Shook and Mikulcik deny the statement you attribute to them. Saulet and his union may try to appeal, but, as of today, Urquhart says they have not. Saulet has long history of misconduct, with approximately 120 allegations against him and 21 cases of sustained misconduct (more than any other officer in the department). The sheriff’s letter says that Saulet repeatedly was told to improve interactions with the public, and provided with remarkable investments of coaching and counseling. Saulet underwent three performance-improvement plans, two training sessions, and two multi-visit sessions with a social psychologist, coaching sessions with supervisors, and 80 hours of time off without pay. Saulet was demoted from sergeant to deputy for another incident in August. For the record: I’m not gleeful that Saulet got fired, although it’s welcome evidence that Urquhart takes complaints seriously. This incident—and my complaint—is not about me. After growing up in this town, I believe that certain cops regularly submit civilians (particularly racial minorities) to abusive treatment—much more abusive than what I faced here. Often, folks don’t complain, and when they do, the record shows, bad cops are often wholly or partially exonerated, even when they’re guilty. We know from a US Department of Justice investigation that Seattle cops have a practice of using excessive force, and we know from internal audits that the King County Sheriff’s Office has had problems disciplining bad cops. So now, more than ever, I think citizens should complain if they encounter hostile, unconstitutional, or violent policing. Sheriff Urquhart has only been in office about one year. Again, it’s good to see him taking complaints against problem cops seriously. Most cops are not problem cops. Most work hard and keep us safe. It’s miserable that abusive cops ruin those good cops’ reputations, and if we’re going to get from here to a place where the public trusts the police more, it will require police brass continuing to punish the bad apples, as Urquhart has done. Urquhart added that I was “treated no differently than other people” who file complaints. His decision to terminate Saulet was not because I’m a reporter and editor at a newspaper, he said. “We would do exactly the same with anyone making these allegations.” Urquhart has fired other deputies accused of misconduct.